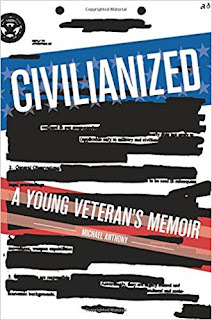 Local resident Michael Anthony presents his book “Civilianized: A Young Veteran’s Memoir” at the Bridgewater Public Library on Tuesday, June 27th @ 6:30 pm. Michael spent six years in the army reserves, with a sixteen month deployment, and twelve months in Iraq, where he served as an operating room technician. After his service in the Iraq War, he earned a BA in English Literature from Bridgewater State University, and an MFA in Creative Writing at Lesley University. In this dark humored War Memoir, Michael discusses his return from war and how he defeated his PTSD. It is a must read for any veteran, or anyone who knows a veteran, who has returned from war and suffered through Post-Traumatic Stress Disorder (PTSD). “Civilianized” has recently won the 2017 Massachusetts Bay One Book Award. Books will be available for purchase and will include a signing.